About a month ago, Ben Leventhal was tasked by Grub Street with polling what he called the “most important and aware food writers in the country" with the goal of “capturing a moment in time in the restaurant business.” They might do it annually, he told me. Since I am easily flattered, I readily answered his questions. These are the results. I had a smooth flight back to New York from Denver yesterday. A window seat, just a slight delay in our departure, and a polite, tiny young woman in the middle seat who curled up and went to sleep right after takeoff and pretty much stayed that way. It reminded me that I had one blog entry left to do about my recent trip to Hawaii. My journey started in Newark, where rain storms delayed the flight enough to put the possibility of my connection in Phoenix very much in doubt. Worse, it gave my neighbor a chance to strike up a conversation with me. Because people rarely start talking to each other in the air. It's on the ground, during a delay in takeoff, that the camaraderie of perceived mutual misfortune helps people to form a bond that risks keeping them inextricably linked for many hours. Also, I had a middle seat. In the window seat was a nurse from California in late middle age who had lived on the East Coast for many years but still thought that California was better in every way. Why she thought she should share that with me, a willing immigrant to New York from the mountain states, I don't know. Why anyone thinks that it's friendly conversation to say that where they're from — geographically, culturally, psychologically — is better than where the person they're talking to is from, or lives, or likes to be, is beyond me. But she came from the Bay Area in the 1960s and was under the misapprehension that California is a relaxed, mellow, laissez-faire kind of place where people can do whatever they like without judgment from others. I pointed out that her native land currently has a very arch, politically correct culture that does not, in fact, encourage people to do whatever they like, whether it's drink bottled water, eat eggs that don't come from free range chickens or smoke tobacco cigarettes in public. She had lived in Hawaii, though, and gave me the same advice that many people gave me when I told them I was going to O‘ahu. Well, okay, but I was only going to be in Hawaii for a few days and was, in fact, a guest of the island of O‘ahu. And, in fact, since I am a city person who enjoys exploring the cultural culinary diversity that is bred in urban cultures, Honolulu was the place for me. Still, I thought her advice might be sound until she told me about the kukui nut lei that she bought from a merchant. It was so special to her, she said, because the merchant blessed it. Well, why wouldn’t she bless it? I’d bless it, too, if it meant you’d buy it from me, and I’d send a whole lot of aloha to go with it. But I didn’t tell her that. Let her enjoy her kukui nut lei. I enjoy mine (not the faux one mentioned earlier, which didn't make it back to the mainland with me, but the hefty one I'd gotten some years before and lurks somewhere in my apartment). I made my flight from Phoenix to Honolulu with minutes to spare and found myself in a middle seat, which I shared with a tremendously fat woman who had the aisle seat. In the window was a young man who wore those little ear buds to listen to music. I didn't know they could be turned up so loud that the people around you can hear your music, but, indeed, they can be. So that was a long flight. The first half of the return leg was a snap, really, I had a window seat, and in the middle was an extremely limber woman from a German-speaking country. I assume that from her English-German dictionary; we didn't speak. How did I know she was limber, then? To try to sleep better she simply folded herself in half, at the waist. This seemed to alarm the woman in the aisle seat, who would periodically interrupt her attempted repose whenever a flight attendant came by to see if she wanted anything to drink. But if she did want anything, she would merely unfold herself and ask for it. We were delayed in Phoenix again, giving entrée for my neighbor in the middle seat (I had the window) to befriend me, which he would have done anyway as he was a very jocular conspiracy theorist of a Jehovah's Witness. And I have to say, living as I do in a world of food writers, it was actually kind of refreshing to have someone tell me that the devil was the devil instead of high fructose corn syrup. 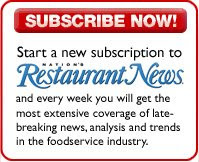 My colleague Elissa Elan reports in Nation’s Restaurant News that Emeril Lagasse plans to open a burger joint at the Sands Casino Resort in Bethlehem, Pa., where he also has a steakhouse, called Emeril’s Chophouse. For more details, you should obviously click on the link. 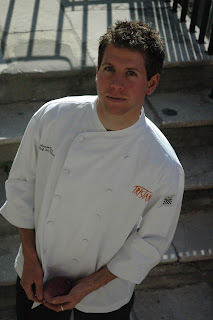 A couple of points of clarification about my my recent blog entry about Aaron Deal, who is quitting his job as executive chef at Tristan, in Charleston, S.C., at the end of the month and moving to Chicago. 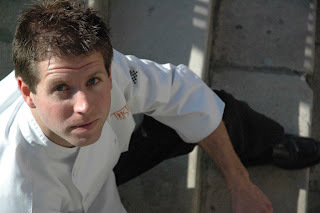 First, at some point between the 2nd and 13th of September, he’ll be doing a stage at Gramercy Tavern. A stage is basically an internship, so it won’t likely have much of an effect on the overall operations at Gramercy Tavern, but New York diners do like to be in the know, so there you have it, New York diners. Chicagoans, Aaron says his job at Custom House will be executive chef, but I’m still not sure whether that means Shawn McClain’s leaving or if he’s just going to take the title of chef-owner or some such thing. I'm sure the good people at Grub Street are on the case..
Update: I just learned that Aaron will be replacing Richard Camarota. Last time we heard from my friend Morou Ouattara, he was working on opening an Italian restaurant in Crystal City, Va., in July. Well, that didn’t quite happen, but a restaurant not opening on time is hardly a shock. But today he tweets: we have all our required licenses. we will do a very slow opening tomorrow night." I was going to start this blog entry with some witty quips about why I wouldn’t be seen at the New York food world’s parties this month, but it’s better to cut to the chase with these things. He has pancreatic cancer, and that kills you. So I’m with him in Denver, helping my mother look after him, changing his chux — sort of a bed diaper, a plastic sheet covered with an absorbent, cotton-like material — moving him to try to alleviate bed sores, giving him what love and support I can to help ease him to rest. It’s not satisfying or fulfilling, but I’m glad that I’m here. Well, maybe not glad, but I think I’m doing what’s right, or as right as possible. He’s spent the past 42 years looking after me, so this is the least I can do. And in this digital age I can work from here, too, so I’ve been interviewing people about food-safety regulations and interesting potato dishes and White Castle’s new charity award program, pausing periodically to give my dad his pain medication. If you like my sweet, good-natured friendliness, I got that from my dad. And my work ethic, and my sense of loyalty. You should have seen him flirting with the health-care workers back when he could do that – not in a gross old man way, but in the sort of nice, non-threatening manner that makes people feel appreciated. He wanted to be so accommodating that when they asked him if he was in pain, he’d say that he wasn’t, I think instinctively, because he didn’t want to trouble them. We had to remind him that, in fact, he’d told us that the blood clots in his legs hurt quite a bit. He stopped swallowing today, so we’re swabbing his mouth with a moist lemony cloth made just for that purpose. We’ve been playing videos and music we think he’d like. He’s a big Bill Cosby fan, and so I was raised listening to the comedian on a four-hour-long reel-to-reel tape that Dad has of him. Watching “Bill Cosby: 49,” the other day, I realized how much my sense of humor had been influenced by his. And we watched Fantasia, a favorite movie of his, and movies with music from the Big Band era. Dad, who played the drums, had a big band when he was a teenager in Baltimore, called Bill Thorn and The Socialaires. They even had a television show that was eventually beaten in a ratings battle with American Bandstand, so I’m told. He lived in New York for a couple of years in the 1950s, after ending his tour of duty in the Navy and getting a degree in communications. He worked as an editor for NBC, among other things, but eventually he moved to Denver to find a wife, get married and start a family, and his family has been his only priority ever since. He retired 14 years ago as the head of public information at KRMA-TV, Denver’s first public television station (Channel 6), so when I complain about idiotic publicists, it’s not the profession I dislike, it’s the idiocy. I got my fascination with food from my dad, too, and one of my earliest memories is watching him fry bacon. He’d done all of the cooking for himself and my mom since he retired, so I’ve taken over those duties. Mom’s an easy diner, and would likely be content with nothing but turkey sandwiches, but I like cooking. Lately I’ve done mostly simple stuff involving dressing up leftovers and using up things that had overstayed their welcome in the fridge. I did my own interpretation of Cubano sandwiches from some pork tenderloin and French bread that my brother dropped off, and pickles and cheese from the fridge. I did buy a whole chicken, which I cut up, made stock and a garlic-and-pepper-chicken stir-fry. I saved the wings, though, which I also marinated in garlic and pepper, dusted in flour and deep-fried, because Mom and I like wings. I rendered the chicken fat and used it to make bread. I bake like a cook, not a baker, without precise measurements, and so my bread is different every time, but it’s always good, because unless you burn it, homemade bread is good. Even if you kill the yeast, you can still make some tasty crackers. Many people are intimidated by bread, but honestly, it’s a snap if you don’t take it too seriously (don’t tell Rose Levy-Beranbaum I said that). Take a tablespoon or so of dry yeast (that’s one packet), toss in about the same amount of sugar (maybe a little more, depending on your mood), a little less salt than that, a quarter cup or so of whatever fat you like (melted if it’s butter or shortening or lard) and about half a cup of water that’s hot enough to activate the yeast. Add flour, any flour, whatever flour you like, although a fair amount of it should be wheat flour because you need wheat’s elasticky gluten if you want the bread to rise. Whisk in the flour until it becomes too thick to do that easily. Then switch to a wooden spoon or other mixing implement of your choice. Work in the flour as you kneed the dough (you can even do it in the bowl you mixed it in if you don’t want to get flour all over a work surface), until the dough is springy and smooth. I don’t know how much flour to add. It depends. Aim for around three cups. Find a bowl that can contain about twice the volume of your dough. Coat it in oil — any edible oil. Drop the ball of dough in it, flip it over to coat it in oil, cover it with plastic wrap or a moist cloth and leave it in a warm place until the dough doubles in volume, which will take an hour or two or six depending on the flour you used and the quality of your yeast. Punch it down and let it rise again if you want. If you don’t, skip that step. Shape your dough into whatever size loaf you want. If you want to put it in a greased loaf pan, do that. Yesterday I rolled the dough into little balls to make them into rolls and put them on a baking sheet that I’d sprinkled with cornmeal to keep the dough from sticking to it (although I could have greased it). I let the rolls double in volume, more or less, brushed them with an egg mixed with a splash of milk, and baked them at 425° until they were brown (to see if bread is done, tap it on the bottom; it should sound hollow). I’ve learned a lot going through all of this — ranging from how grief works to techniques for moving people who can’t move themselves to the amazing efficacy of a beer or two at Wyman’s, the sports bar a block away, to help me decompress — and I’m still processing much of it. Thank you for your kind comments, and your e-mail messages and Facebook notes and tweets. I appreciate it all very much. I had made breakfast for my mom and me (egg sandwiches on homemade rolls with cheddar cheese) and was heating water in the kitchen for another bread venture. My parents were in the dining room, next to the kitchen, where Dad’s hospital bed had been set up. Mom called me and asked if I thought maybe Dad was dead. His breathing had become shallow and raspy the night before, so we did what Polly, the hospice nurse, had told us to do to help make him comfortable. We gave him a bit more of the synthetic morphine he was being treated with and turned up his oxygen. Morphine expands blood vessels, you see, and more oxygen might make it easier for him to breathe, and it wouldn’t hurt. He slept through the night and was sleeping in the morning, too, and then Mom noticed his breathing seemed to have stopped. I felt his neck for a pulse, but since I don’t know how to feel for a pulse I didn’t know whether my inability to feel it was my own fault or not. I shrugged my shoulders. His jaw was slack, and when Mom closed it it just dropped open again. She decided to wait ten minutes and then call the hospice, and I went back to making bread. The last rolls were kind of tough, but fresh out of the oven they still made good sandwiches. Perhaps, I thought, I should use more of the user-friendly all-purpose flour, and maybe make looser dough, with a higher water-to-flour ratio. Polly came over and confirmed Dad’s death and we started making phone calls. Mom handed me a pretty flowerpot adorned with dragons and asked me to wash it out. She’d called the crematorium that morning and found out that the urn she’d chosen for Dad had too narrow an opening. It needed to have a mouth at least four inches wide. My immediate family and some cousins and family friends came over, and I realized that I, and I think Mom, weren’t on the same part of the grief continuum that they’d expected us to be on. I had done the initial freaking out a couple of weeks before, when Dad was diagnosed. At that time I wondered how anyone coped with such grief. I took the day off and went to the Five Guys in my neighborhood in Brooklyn and ate a hamburger and too many French fries. The next day I woke up and realized how people cope with such grief — they just do, one day at a time. By the time Dad died I’d already processed the new reality. I’m sure I’ll have other waves of grief washing over me soon, but the first wave had passed before I arrived in Denver. Mom was over it, too. So we took care of the business that it was necessary to take care of, hosted the family and friends who stopped by, and opened a bottle of wine. I finished making the bread dough, but had to fudge it as I realized I’d forgotten to add the fat. What a silly, silly thing to put in an e-mail. What if all was not well? Should I tell you so? What would be the point of that? A telemarketer called Mom and asked for Dad. She told him he’d just died that morning and we had a good laugh when the telemarketer hung up, wondering how long we should work that angle. After Mom went to sleep and I’d cleaned out my e-mail box and written up Steak n Shake’s third quarter earnings (you’ll be glad to know that they’re up, and so is restaurant traffic, although check averages are down) I went to Wyman’s for a quiet beer. “How was your weekend?” The bartender asked. I hadn’t been to Maloney & Porcelli in years and years, since we had a going-away party for Bill Carlino when he abandoned Nation’s Restaurant News to become editor-in-chief of Accounting Today. That was a long time ago, before 9/11, back when the economy was good and managing editors got hired away by other magazines to be their editors-in-chief and the whole editorial staff went out to fancy dinners to give them a royal send-off. Can you imagine? If I remember correctly, I had the restaurant’s signature crispy pork shank. I also had a version of that dish at Hawaiian Tropic Zone when it opened. What does an old-school steakhouse and a sun-tan-lotion themed restaurant with scantily clad waitresses that wear numbers so you can vote for them during the floor show have in common? The menus were both developed by David Burke. Back when Bill Carlino quit, David was corporate chef of the Smith & Wollensky group, which included Maloney & Porcelli and assorted other steakhouses, and the Manhattan Ocean Club. Smith & Wollensky founder Alan Stillman (who also founded TGI Friday's, by the way) spun off the single-unit restaurants from the steakhouse chain a few years back, but he’s still the boss of all of them. And of course just because I hadn’t been to Maloney & Porcelli since King Arthur ruled in Camelot and it didn’t rain during the day, that didn’t mean the restaurant had been stuck in time, so when my friend Steve Remming suggested we have dinner there, I thought it was a good idea. Steve’s a manager and sommelier at Maloney & Porcelli, and he sort of continued to manage and be sommelier during dinner. Waiters came by to consult with him about wines, and of course he kept surveying the place during the course of the meal, because you can’t turn that kind of thing off. And business was good. The restaurant was mostly full and people looked like they were having a good time. And it was a Wednesday. Had it been a weekend we could have taken advantage of the $75 three-course weekend wine dinner that the restaurant offers. That's three-courses of your choice from the regular menu, plus all-you-can-drink wine — not any wine, of course, but good stuff, nonetheless. Alan Stillman knows a lot about wine; he even had a vineyard on Long Island for awhile. And of course Steve’s no slouch either. Since I was eating with Steve, we didn’t have to take advantage of any deal, because employees at Stillman’s restaurants get good benefits, including nice meal privileges. Local corn cooked al dente and served in a sauce of cream and "corn milk." And we drank half-bottles of Pouilly Fuissé and Crozes Hermitage.